It is the beating heart of Tuscany, a place rich in history, traditions and spectacular landscapes where more and more people choose to live on their wedding day: we are talking about Siena. You will certainly know this city, or if you are lucky you will have visited it at least once in your life, to admire its beauties or to attend the famous Palio, the horse race held every year during the months of July and August. 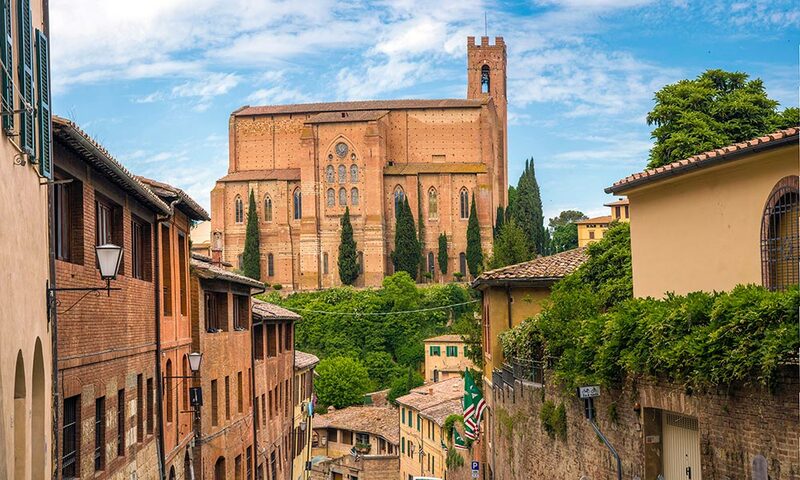 Siena, unlike Florence, renowned for its Renaissance beauties, is the most representative Tuscan city of the medieval atmosphere, and certainly one of the most fascinating locations that you can choose throughout the Italian territory for your wedding. It was originally founded and built by the Etruscans, but most of the monuments that can still be admired today date back to the 12th century. 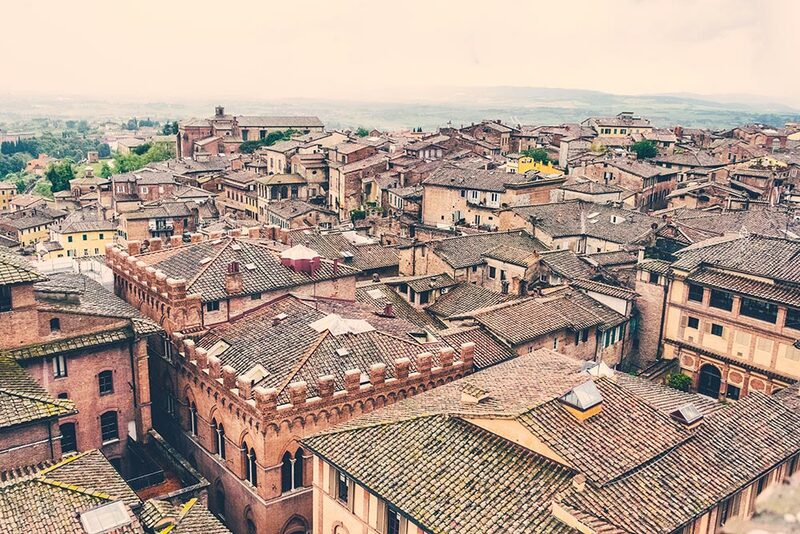 In Siena you can admire the beauty of Gothic architecture, be amazed by the sight of Piazza del Campo, stroll through the streets of the centreand find at every corner something to discover. You can experience the exceptional taste of Tuscan cuisine, savour the typical dishes of the area, taste the finest and most renowned wines of the world. And it doesn’t end here, just outside the city you can be pampered among the hills of the Chianti wine, in ancient villages immersed in the most beautiful countryside of Italy. Also, if you get married in spring or during the first days of summer, this area of Tuscany will offer you the best of itself, with painted landscapes, long and mild days, unique atmospheres. Do not think that it is inconvenient to reach it: the city is about 1-hour drive from Florence airport, 2 hours from Pisa and just under 3 hours from Rome! But which are the most particular and sought-after locations in Siena and surroundings? First of all, the Hall of the Consistory in the Public Palace of Piazza del Campo, where the Municipality of Siena is located and where you can organize a civil wedding. It is a place rich in history, culture and art, ideal for those who want a location full of beauty and a ceremony in perfect Tuscan style, in the heart of the city and with luxurious details. By getting married here you will have the opportunity to go out in the beautiful Piazza del Campo right after the ceremony, a truly breath-taking place, where you can take pictures that will be unforgettable to say the very least!! Also, in the Palazzo Pubblico we recommend the beautiful Loggia dei Nove, a real balcony overlooking the city, still a short walk from Piazza del Campo, ideal if the ceremony takes place during the hottest seasons. Another very beautiful room is that of Palazzo Patrizi, an elegant historical building recently renovated, also located in the city centre, with frescoed ceilings and ample space to accommodate many guests. For Catholic weddings Siena also has one of the largest and most beautiful Gothic cathedrals in Italy: the Duomo. Its marble interior, large dome and majestic facade make it a place not to be missed for those visiting the city, but also one of the most beautiful and fascinating location for the most important day of your life. For those who prefer a civil ceremony in this area of ​​Tuscany, but surrounded by nature, there are many options: among the most popular there is certainly the famous Abbey of San Galgano, a church built between 1200 and 1300 by monks, now deconsecrated and very fascinating because it has no roof, with a magnificent view of the sky and the surrounding countryside. For those who want a ceremony in spring or summer, amidst cypress trees, sunflowers and the curves of the Chianti hills, this location is simply perfect and, let’s face it, truly unique! We cannot fail to mention some historic towns a few kilometres from Siena, also rich in art and beauty, ideal if you cannot resist the charm of the small village: among these we recommend Pienza (also famous for its tasty pecorino cheese), Monteriggioni and San Gimignano. Whichever location you choose to get married, remember these names and do not miss out on having a walk, an aperitif, a dinner or on taking some pictures in one of these magnificent places immersed in the heart of Tuscany. Choosing to get married in Tuscany, and particularly in Siena and its surroundings, does not mean just choosing a location: t means embracing a lifestyle, a culture, immersing yourself in the traditions of these places and really discover the sense of the expression “dolce vita” (“sweet life”). Your wedding in Siena could therefore be an opportunity for you and your guests for a full immersion in the traditions of Tuscany. The lucky ones who get married between July and August could attend the preparation of the famous Palio of Siena, the oldest horse race in the world, which sees the 17 districts of the city compete. This tradition has been carried out by Sienese citizens since 1300 and visiting Siena at this time of year is a truly unique experience in the world. On many occasions, you can attend banquets, parties and celebrations even before the race of the Palio, and feel all the passion with which this event – even today – is organized by the local population. Let’s not forget that one of the strong points of this area is the cuisine: in Siena you will be spoilt for choice between restaurants and trattorias where you can enjoy excellent wild boar meat, fantastic cold cuts, bruschetta and traditional Pici (a kind of thick homemade spaghetti), just to name a few examples. And given the know-how that distinguishes these areas in terms of food, adding these dishes to your wedding menu wouldn’t be difficult if you wanted to. You are in the heart of the Chianti wine area, so you can accompany everything with a glass of white or red wine, and if you want, you can also taste different types of them or visit the cellars where they are produced. Among the most famous: the Rosso di Montepulciano, the Brunello di Montalcino and the Vernaccia di San Gimignano, just to name a few. Siena’s lands are also famous for their typical desserts. You can’t miss the Ricciarelli, the Cavallucci or the Panforte, local traditional desserts good all year round but sold especially during the Christmas season. An explosion of unique flavours, which together with all the other goodness and beauty that this land has to offer, will make your day all the more special.